How can you transform a messy box of files like this into something nice and organized like this? 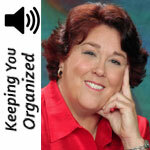 Today we are going to show you how using color to organize will save you time and frustration. 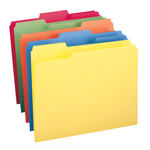 The whole reason color coding works is that it allows you to visually identify your files by category. Smead recommends dividing your files into 4-6 different categories so that it’s easy to remember. For office filing you might have one color for vendors, one color for projects, one color for personnel files and one color for financial information. Take a look at your present files and try to divide them into 4-6 categories. It will become obvious which categories you should use. Next – you need to get the filing supplies that will work best for your situation. Do you need file folders or hanging folders? 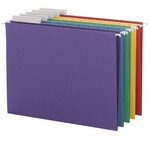 Smead filing products are available in a rainbow of colors so you can create the color scheme that works best for you. 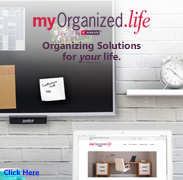 Finally you want to determine how you will label your folders. Some people prefer to write directly on the label while others prefer to use a self-adhesive label. 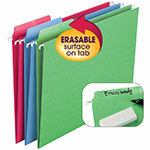 Whatever your preference, Smead recommends SuperTab Oversized Tab folders with 90% larger labeling area. You can also use a computerized labeling system like Viewables to get a professional looking 3D label that you can easily read from the front, back and top. Whatever labeling method you use, make sure you use a consistent labeling scheme. If you have several files that would go into a subcategory of another file you should consider using the category name a dash and then the file name. For example: Travel – Boston and Travel – Los Angeles. 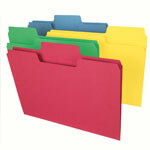 2nd – Choose the right filing products to fit your situation. 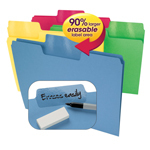 And 3rd – Use a consistent labeling scheme to make organizing and finding files easier. Like this tip? Share the love with others and make sure you subscribe to Smead’s YouTube Channel!